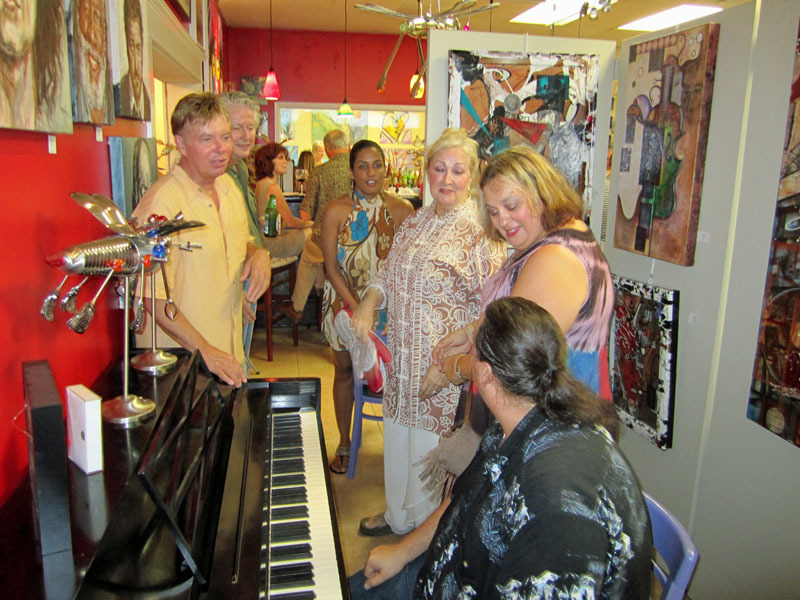 Sanford's newest addition to the art and food scene is The Palette, located a Art Affair Gallery on First Street in Downtown Sanford. If the food, wine, and beer I sampled at their "Arty Party" grand opening is an indication of their wares, they will do well! Local art evangelist, artist, and entrepreneur Ronda Richley, founder of Art Affair Gallery, has team up with the owner of the locally favorite (and much missed) Two Blondes and a Shrimp, Sherri, have teamed up to open a wine, beer, and food bar inside Art Affair Gallery. Now you can truly eat with the art and the artists--quite a few of the gallery's featured artists were in attendance at the Arty Party. 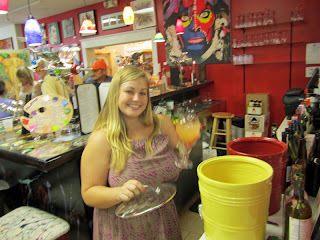 The opening gala featured Sangria by barmaid Lauren (who was kept mighty busy!) 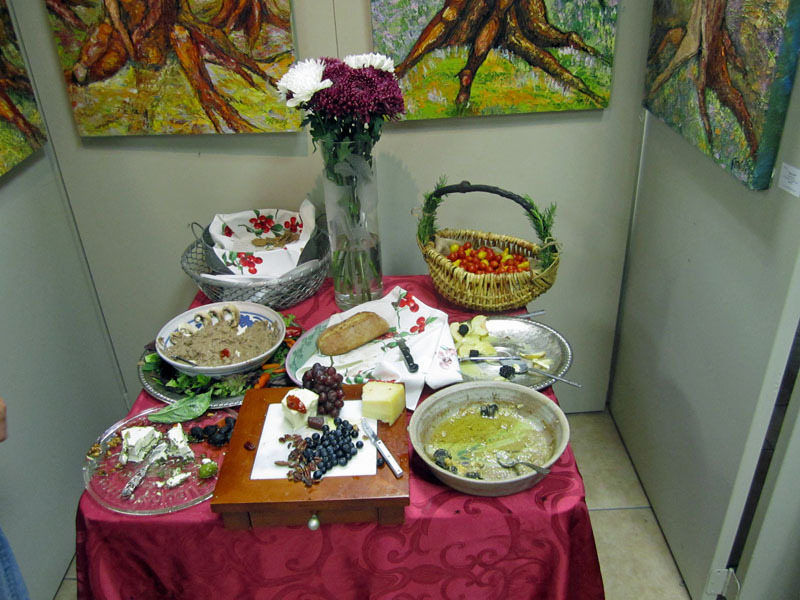 and every half hour Sherri would bring out another appetizer-creation for sampling. I tried to sample as much as I could, but I will say, you had to be quick to get some, it was all that good! One comment about the Sangria--it was good but was missing something--I think a bit of clove or maybe a stick of cinnamon would have pushed it over the top and given it a bit of mystery. But still, it was pretty darned good and I noticed that it all went through the course of the evening. The appetizers that I sampled were all great and freshly made by Sherri. If you don't see a lot of food in the picture, it's because it was devoured before I had time to snap a photo. My favorites were two. First off, Sherri's Layered Concoction was a pleasure just to look at. Pesto, roasted red tomatoes, cream cheese , and basil were layered like a torte. Second, the Van Gogh was a very pleasant surprise--a vetegable/vegetarian pate was surrounded by huge sliced mushrooms and served with some artisanal bread and chips--it was delicious. All of the food was delicious. The assortment of crackers was astounding, the cheese was excellent, the baked brie and pears very good. I can't wait to come back some day and try the sandwich. The menu at The Palette is small and very European in style, meant to be mostly appetizers, desserts, small plates that can be shared while drinking some wine or sangria, having one of the nice selection of craft beers, or over a cup of coffee. 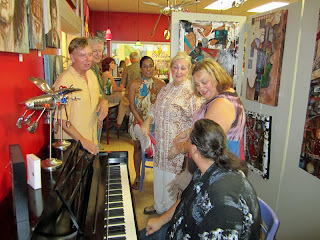 Many of the local artists were in attendance, and I suspect will be hanging out here as well. And if you can play the piano--or even if you can't--it's worth a try. 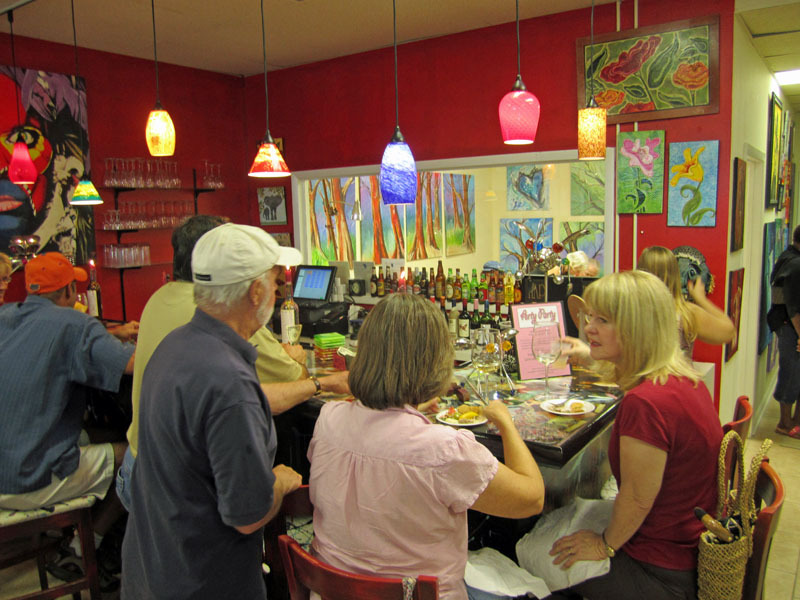 The interior of course is an art gallery, so you can wine and snack among lots of great local art--much of it by nationally and even internationally collected artists. The table and even the bar top themselves are actually works of art! And for those pleasant evenings, there is outdoor seating as well. I have been a big fan of Art Affair Gallery since day one when they opened in a small space just a few doors down from the current location, almost two years ago. Since that time, they have moved to a larget space, then expanded, and now added the wine bar. I myself have provided the food for several events there, usually Sanford's Alive After Five and/or the Fourth Friday Art Walk. It is always a great time and alway a lot of fun. 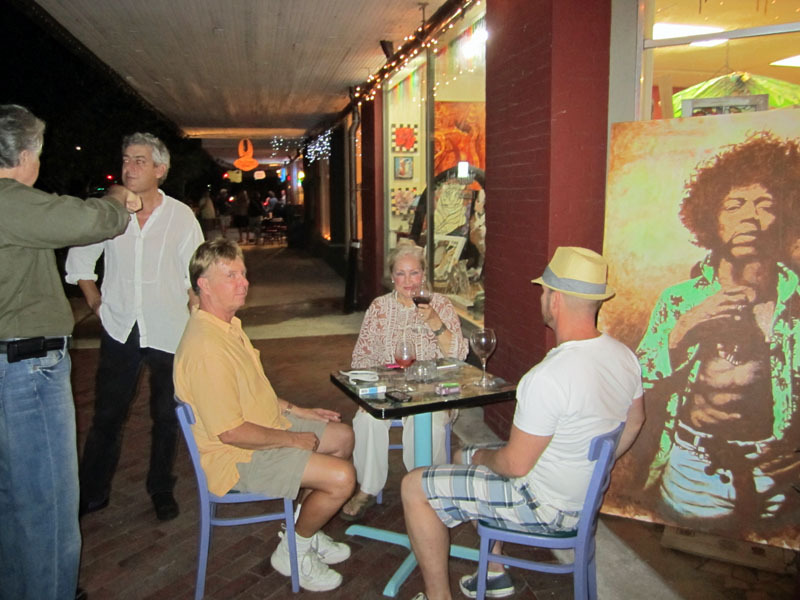 Over the past two years I have gotten to know many of the artists and other locals who are a part of the downtown Sanford art scene. And I've eaten at and reviewed many of the local restaurants. Downtown Sanford is really a happening place. Hope to run into you there sometime! Our second dinner-time visit to the Tilted Kilt was not quite as satisfying as our first. We started out with some Chips and Salsa--they were OK, but pretty run-of-the-mill. 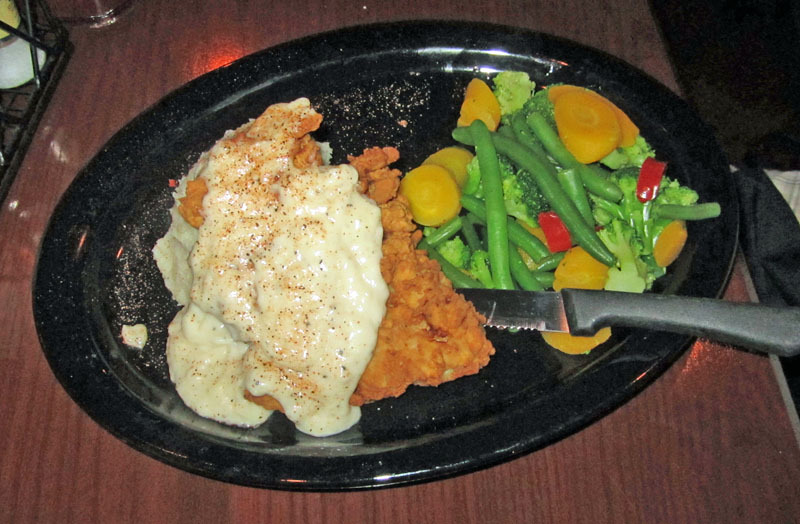 My friend Tommy had the the Chicken Fried Chicken, fried chicked was served with garlic mashed potatoes and a creamy gravy, along with some vegetables. It was OK, not great, but OK. Certainly edible!. I had the Maggie Mae's Fish & Chips, and i was disappointed. 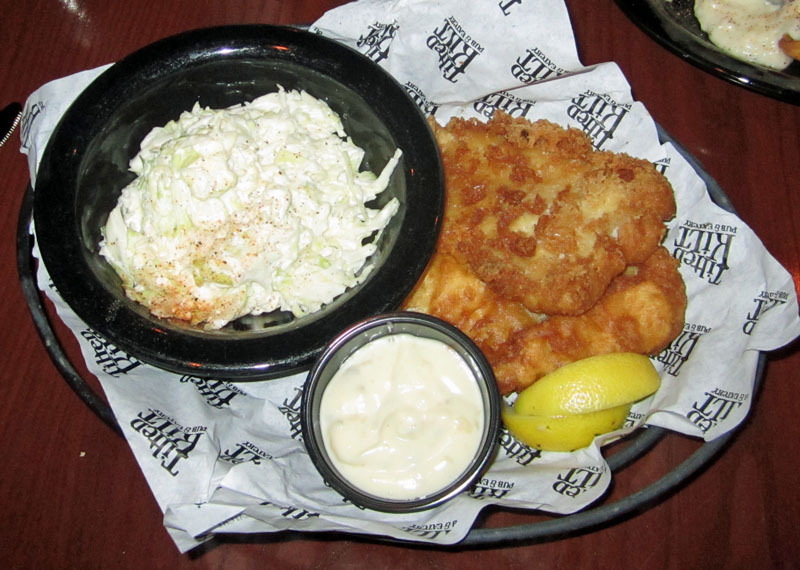 The double portion (replacing the fries) of creamy coleslaw was OK--it's hard to ruin coleslaw in my book--but the breading on the fish was greasy and did not stick well to the fish, falling off in chunks. This reveals improper breading technique. The fish itself was OK, but what's the point if there's no breading. Though the bill this dish as a "true English pub classic of battered cod," it sure did not make me want to go to an English pub and have fish and chips. If this is "true English" then I would not be a fan. It was not awful, it jsut was not the best. And the worst part was the greasiness, probably due to oil that was not quite up to temperature, and being pulled out just a bit too soon. I would not order this again. I had the pleasure of dining at Café Paisano Italian Grill & Pizzeria on a rather rainy and stormy Friday evening. Yes, we got wet trying to get back to our car during a downpour, but it was all worth it--the food was very good! Lisa, our waitress, took very good care of us. 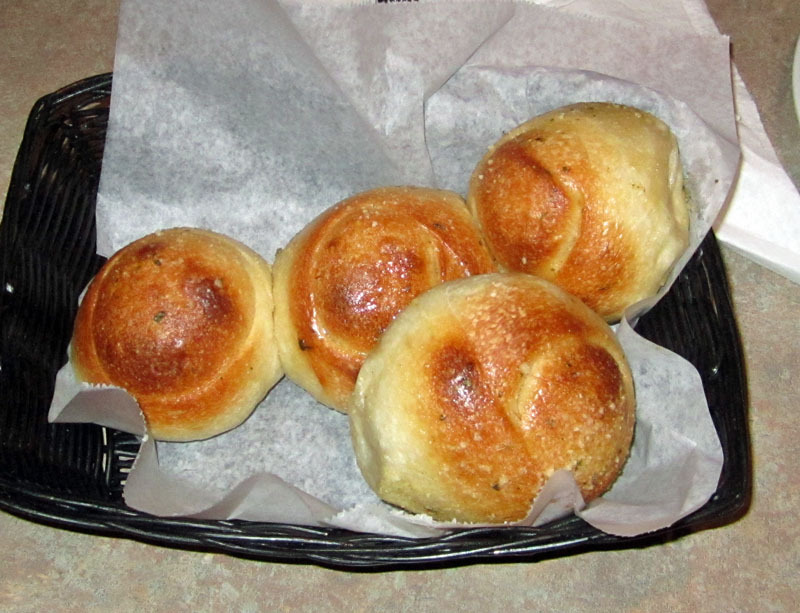 After we ordered, our Garlic Knots arrived. They were good, more like fresh yeast rolls with just a hint of garlic and oil, but definitely fresh-baked, light and airy. They stood on their own and didn't need anything like butter, they were delicious with a hint of sweetness, hint of garlic, and hint of oil. Yumm. For an appetizer we ordered the Stuffed Mushrooms. They were delicious. 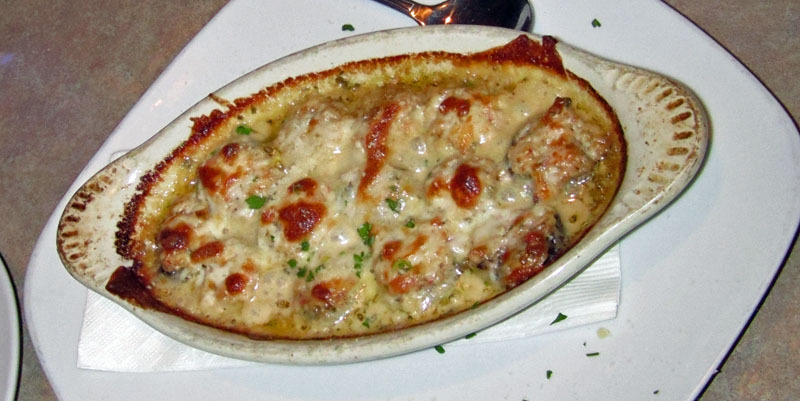 A dish of mushroom caps had been stuffed with a very flavorful crabmeat stuffing, then topped with cheese and alfredo sauce and baked. They were quite hot when they came out, but oh, so delicious. 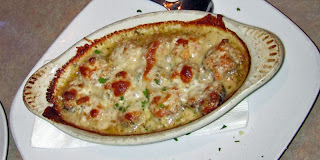 The crab stuffing was the predominant flavor here, not lost at all in the mushroom and afredo/cheesy flavors. So this was a very good dish. Our salads arrived in short order (the timing of the food was fantastic). They were quite ordinary, but good. Just a nice little "start" before the main course. For his main course, my friend Tommy ordered the Friday night special, the Haddock Fish Fry. This was very good. The haddock could not have been cooked better. 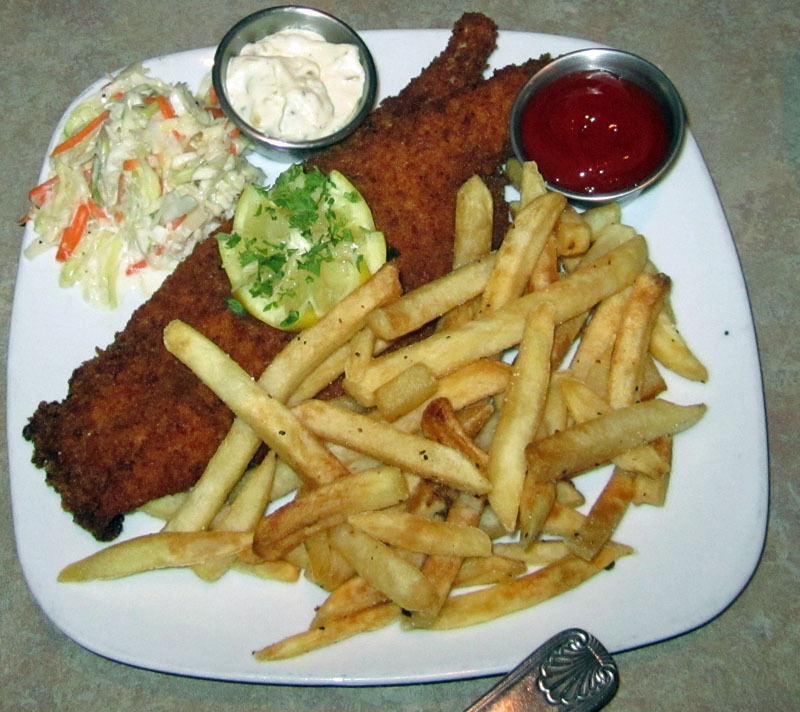 A large, 12 oz portion of haddock had been breaded and fried. The breading was crispy but not greasy, the fish underneath was tender, moist, and flavorful. It was very very good. The french fries that accompanied the meal were also very good. The only real disappointment was the coleslaw--it was not that good. Now, it's really hard to make a coleslaw I don't like, but this was missing something. I think it needed a touch more acid, it was just a bit on the bland and flavorless side. But given the great taste of the haddock and the good french fries, I'll overlook this little miss-step. Overall a very good dinner. My main course was the second Friday night special, Broiled Haddock and Shrimp. A 6 oz filet of haddock was nicely boiled and served along with three quite large shrimp, cooked just right. 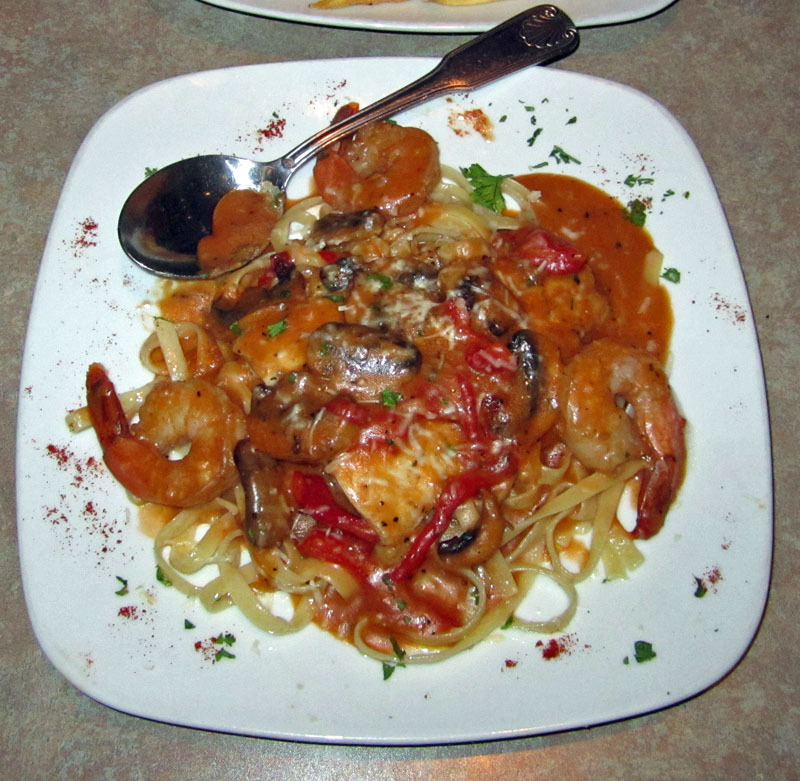 It was all served on a bed of linguine and topped with a lobster cream and mushroom sauce. It was also all very good! The haddock was broiled just right, the shrimp had a nice flavor and texture. The rich sauce added a lot of flavor to the dish and had mushrooms and roasted red peppers in it. 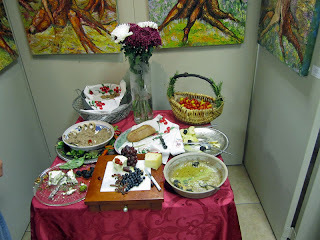 It was good to look at and good to eat as well. I enjoyed this a lot. When we finished eating, we were quite full. 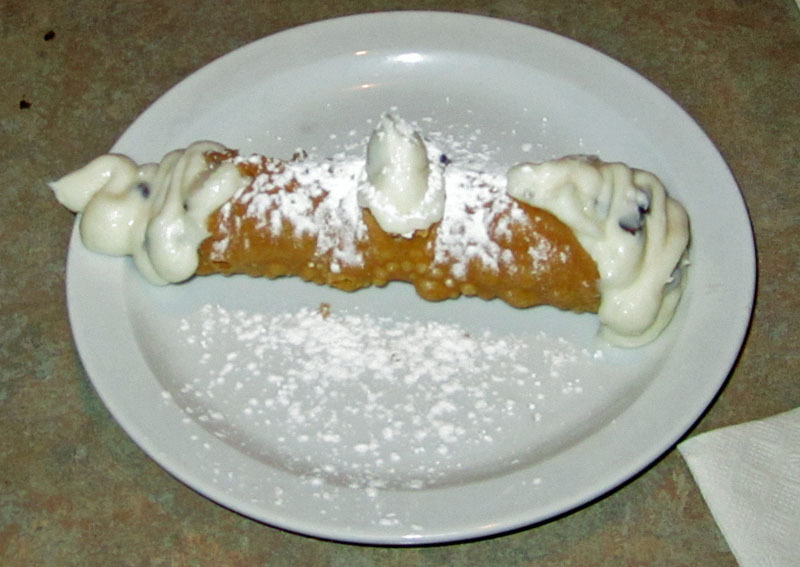 Usually we don't have dessert, but it was still pouring rain out, so we opted to split a single cannoli. It was good, though a bit sweet--or it may just be that I'm not used to desserts and sweets. Still, it was a good cannoli, the shell was nice and crisp, the filling creamy and sweet, with chocolate chips. It was also fun to eat, cracking the shell, getting the crisp shell with the creamy filling. Yumm. It was still pouring when we were all done, and we decided to dash to the car and take of in the downpour. But we left very full and very fulfilled. We had a very good meal here and I'd go back again, for sure. Next time I want to try their pizza, it looked good. I had lunch at Fresh on the Fly yesterday with some friends from work and we all agreed that it was good. I see that on Urbanspoon.com today, it's rated the #75 restaurant in Orlando, no mean feat! I had the Mahi Mahi BLT sandwich and it was wonderful. A bit messy to eat, perhaps, but finger-licking good, believe me. 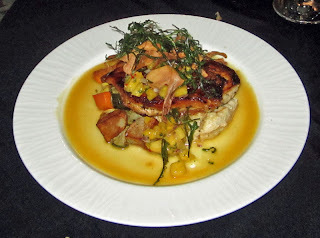 I had a bite of just the mahi-mahi and found that it was cooked to absolute perfection! It was tender, moist, and flavorful, and grilled blackened as requested. 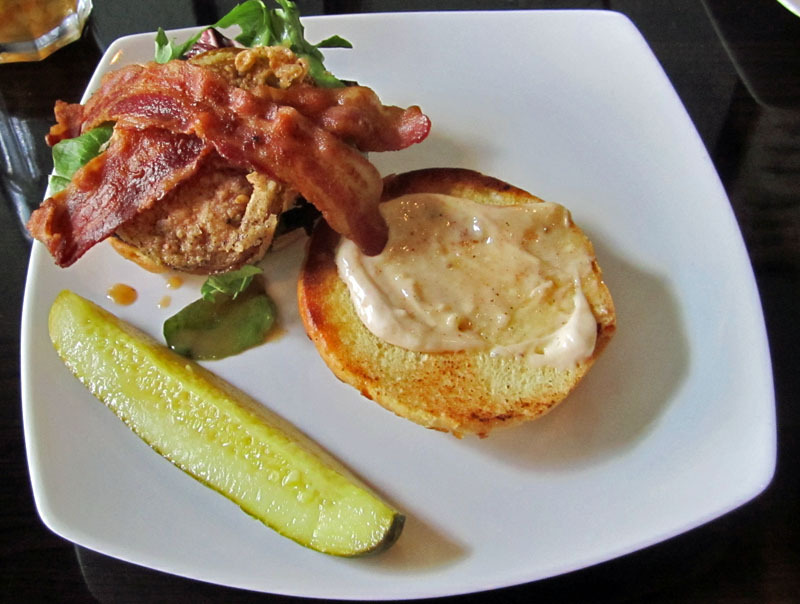 It was served with bacon, a fried green tomato, and greens and dressed with a Florida citrus and chipotle aioli. All I can say is "awesome." It was an excellent choice and well worth it. I'm sure I'll be back, this is an excellent lunch and dinner spot. But if you're going there for lunch, arrive early, it fills up fast, a testament to the fine food! 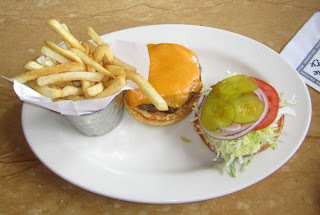 I wanted a good sandwich recently, and found it at The Cheesecake Factory in Winter Park. And a few other good things as well! We stopped in on Memorial Day. After a short wait, we were shown to our table. The menu is huge so it took us a while to decide. 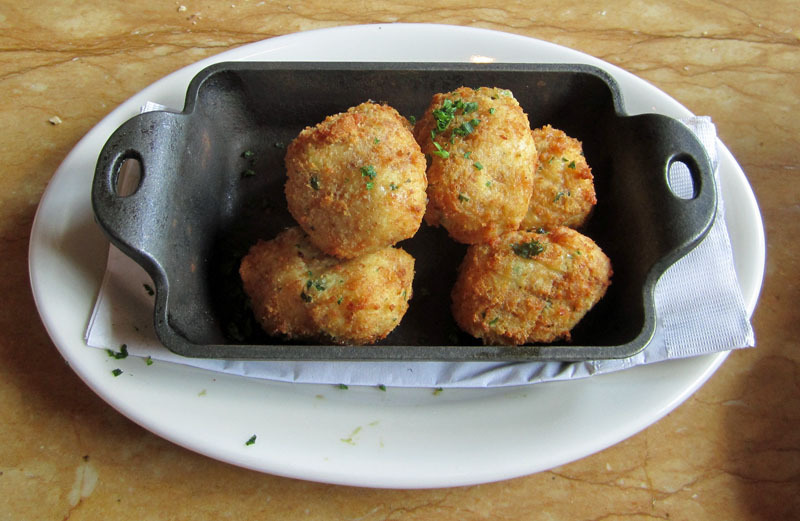 We started with an appetizer, the Chicken Croquettes, and it turned out to be an excellent choice. Tender chicken and fontina cheese were breaded and deep fried nice and crisp. They were outstanding, the cheese added a nice flavor and gooeyness to the tender chicken, while the crispy breading gave it a nice cruch. These were very good, I'm going to have to try to duplicate them myself! For his sandwich, my friend Tommy had the Old Fashioned Burger with cheddar cheese. It was excellent. About a half pound of hamburger was charbroiled and cooked perfectly to the requested medium rare. It ws topped with lettuce, tomato, onion, pickle, and mayonnaise, and served on a toasted and fresh bun. For a side he had the french fries which were also very good. This was just a good burger, plain and simple--and oh, so good! 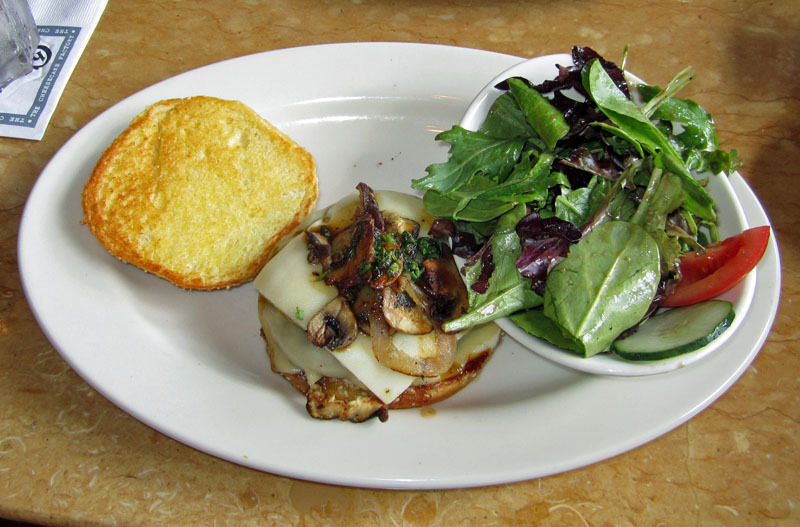 I chose to have the Wild Mushroom Burger. Again about a half pound of hamburger was expertly cooked to the requested medium rare. And again it was served on a nicely toastes, fresh bun. 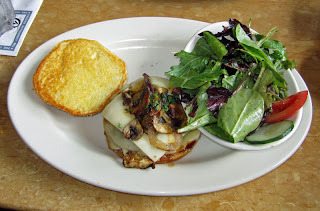 But my burger was topped with lots of sauteed mushrooms of various varieties and onions and mayo. Along with that was melted fontina and swiss cheese. It was excellent. Well cooked and full of flavor, it was one of the better burgers I've had, and best in quite some time. 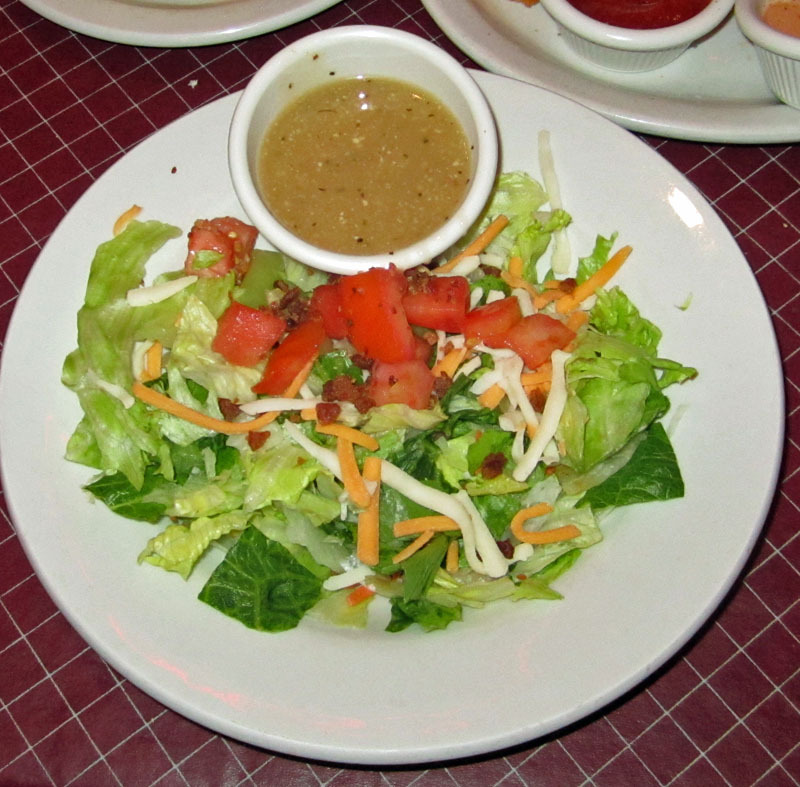 My side was a side salad which was also very good with nice fresh lettuce and well dressed. Yumm. We enjoyed our lunch here very much. There was a lot of food and neither of us could quite eat the last few bites--but we sure tried. It was wonderful. I have wanted to go to Cress Restaurant in Deland for a long time. It was great and I wish I had not waited so long to visit! I will go back soon, I hope. I used their web page to make a reservation on Friday afternoon for that evening. Within about an hour they called and offered a time a half hour later than requested, which was fine with me--as a matter of fact, it turned out to be a much better time for me! Cress is located just a few doors off the main street in Deland, which is a very picturesque old Florida main street. We arrived just a few minutes late and were promptly seated at a nice table right by the window. We were quickly provided menus and a drink order places. I was glad to see an assortments on "craft" beers and had one of my favorites, Red Hook's Longhammer IPA. My friend Tommy was not sure which of two wines he wanted and our waitress, Stephanie, suggested a sample of each, which she quickly provided. That was very nice. 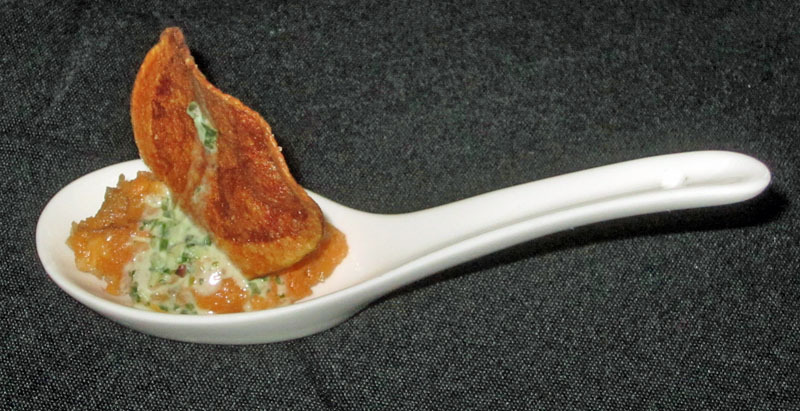 We were quickly presented with an amuse-bouche, a bite of what I believe was a chutney of some sort with mango. I forgot what Stephanie said it was. It was OK though nothing too out of the ordinary. We also were served a few pieces of bread, perhaps a foccacia--the bread was very good, full of flavor. It was a nice start and prelude to the meal. For appetizers, we settled on two items that really sounded good. The first was the Margaret's Jumbo Lump Crab Cake. It was a very delicious crab cake, light and flavorful and was sitting on some remoulade, also quite tasty. It was accompanied by a bit of buttercup lettuce that was dressed with some balsamic, and that was outstanding. The port of the crabcake seemed a bit small (perhaps it was the plating that made it look that way, too), but the flavors were definitely quite good. 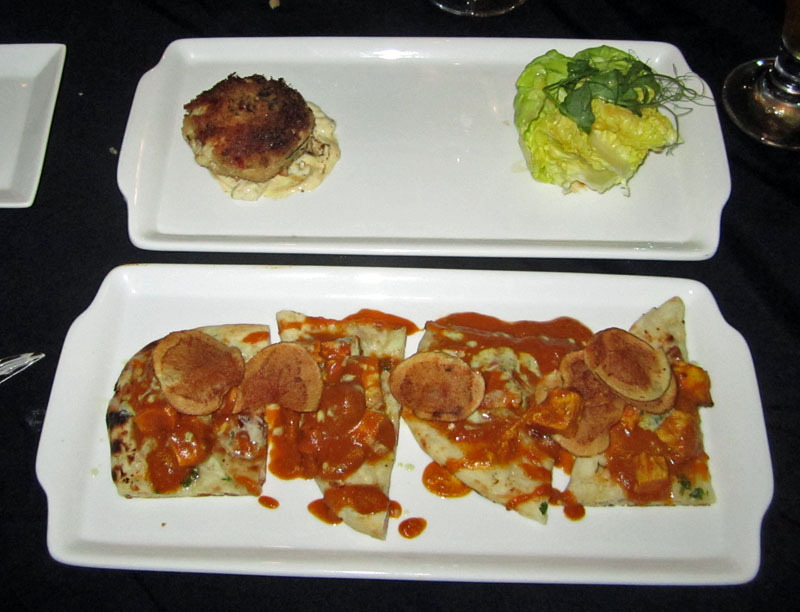 The second appetizer was the Ashley Farms Chicken Tikka Grilled Flat Bread. It was very, very good and a nice portion. The tomato based sauce had a ton of flavor in it. This would make a nice meal, I think too. The chicken was tender and flavorful, but the star really was the sauce. The whole dish as a nice tikka-like flavor. This dish was outstanding. For his main course, Tommy had the Glazed Breast of Ashley Farms Chicken. A tender chicken breast was glazed and grilled, then served on a bed of seasonal vegetables and grits, accompanied by a pineapple pico de gallo, and surrounded by a pineapple habanero reduction. Tommy was concerned about the heat of the habanero reduction, but Stephanie assured him it was actually not too hot and was served so that you could take what you wanted. Well, Stephanie was right. First, the chicken was delicious, as were all the accompaniments. But I thought the pineapple habenero reduction to be truly outstanding. It had a nice sweet taste on the front, and then a bit of heat in the back of the mouth--not too much, just right, and nicely balanced. The whole dish was actually very good. For my main course I chose a favorite, the Creole Shrimp N' Grits. It was a good choice as it was excellent! 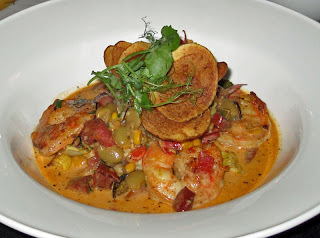 About a half dozen large domestic shrimp were perfectly cooked, servcie wtih a creole sauce with Andouille sausage and roasted vegetables all on a bed of grits. It was just divine. The shrimp were so good and had such a nice flavor from the creole, they were perfect. The vegetables with andouille were wonderful and the grits were able to soak up there somewhat spicy and very full bodied flavor. Sometimes when I've had shrimp n' grits, the sauce is more of an afterthought, but here it was a well thought out and well executed dish. Every element served to accentuate the others. I really though the dish most excellent. Cress is not an inexpensive restaurant, but you get what you pay for. And we got our money's worth here with an excellent meal and great, attentive service. At one point the co-owner and wife of the Chef stopped by to check on us as well, that was nice. It's a nice atmosphere, not a huge place, and has outdoor seating. They had live music as well which was a nice touch. We enjoyed our meal a lot and I'd recommend Cress to anyone in search of a fine dining experience. It was grand! I had never eaten at a Bojangles before, or even heard of them, until one opened up not too far from me in Sanford. So on a recent Sunday afternoon, my friend and I decided to check them out. I ordered a two piece dinner combo, two pieces of chicken breast served with dirty rice and macaroni and cheese. 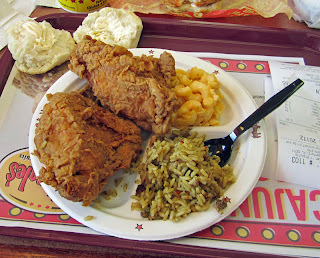 The chicken was very good with a nice and crisp coating, reminiscent of a KFC. The chicken itself was tender and moist, very good. I especially loved the dirty rice--this was very good and quite unique. As a matter of fact, i could see myself ordering just some dirty rice next time, it was that good. And the mac and cheese was good but somewhat typical. The dinner was serve with a fresh biscuit which was very light and airy. My friend Tommy ordered a Cajun Chicken biscuit sandwich and the mashed potatoes with gravy. Now I did not get the "cajun" part of the cajun chicken because it was not all that spicy. But it was tender and tasty and a good sandwich, no doubt. The mashed potatoes were pretty standard, but still good. Overall we enjoyed our meal here. Definitely fast food but with the low prices to go with that. I'd eat here again for a quick meal. 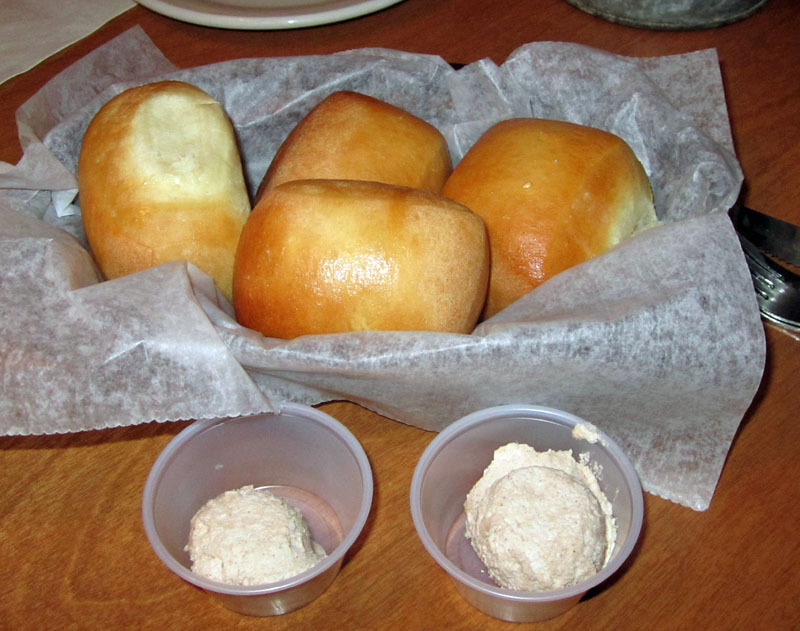 We stopped in at Logan's Roadhouse in Sanford for dinner recently and had a fairly decent experience there. I had not been there in some time, and it was fairly busy, but we were seated right away. After a bit of deliberation, we decided to start with the Bayou Shrimp, popcorn shrimp that were breaded and deep fried and coated with cajun dust. The menu said they were served with a creamy chipotle sauce, but ours came with the usual shrimp sauce. However, our waitress quickly remedied that, and it was worth asking for. The shrimp were cooked just right and with the chipotle sauce, this was a very good appetizer. They were served on a bed of fries which was different, but good. I had a salad with my meal, and it was a good salad. Chopped greens were served with tomato, carrot, bacon bits, and some cheese. The dressing was on the side, which I like. It was a good salad, pretty ordinary, but still good and hit the spot. For my entrée I had the Shrimp Trio, and it was very good. First there was a skewer of shrimp that had been grilled, they were done just right. Then there were some breaded and deep fried shrimp, 10 of them if memory serves me correctly. They were also done perfectly. 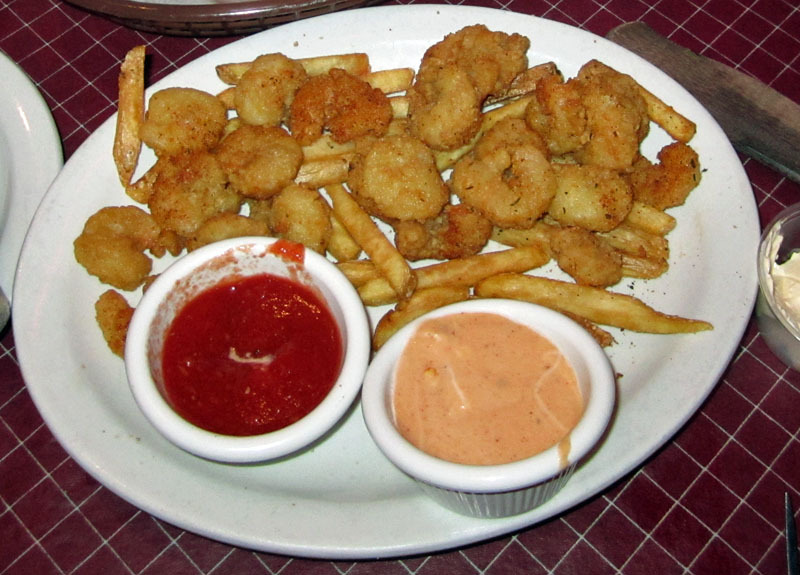 And finally some more popcorn shrimp. 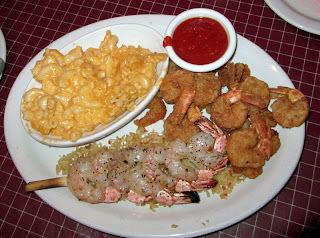 The skewer of shrimp was on a bed of rice pilaf and I had macaroni and cheese as a side. For a shrimp lover's dinner (and I am one), this was a nice meal. Everything was done well and I managed to devour it all! 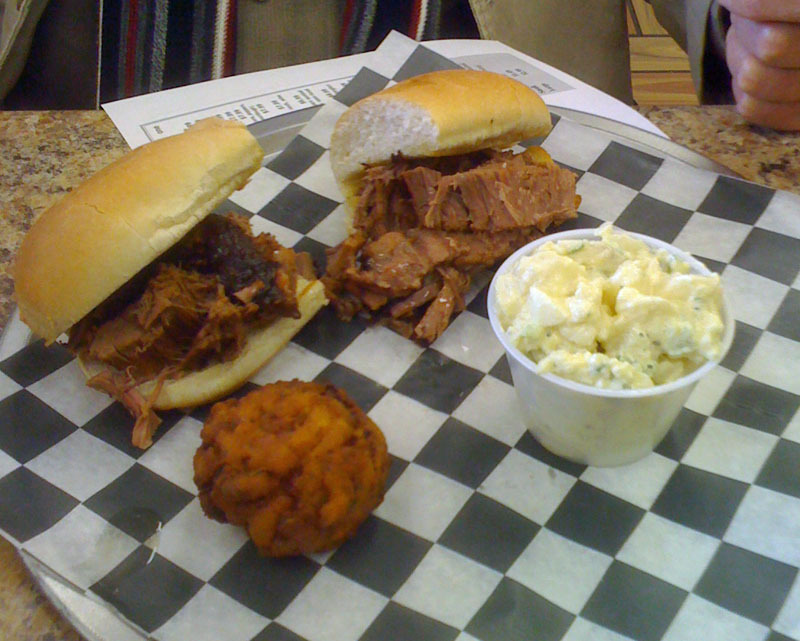 My friend Tommy had the Logan with a salad and a baked potato. The Logan is a nice sirloin steak. It was cooked just to medium rare and was very good, nice and juicy and flavorful. The baked potato was fine as well. Overall, our meal here was pretty good and not bad for the price. I'd come back again another time. Oh, and the free peanuts are a nice touch, especially since you can throw the shells on the floor. Yumm! The reviews on Urbanspoon don't lie. Texas Roadhouse is indeed a very good place to eat, and I envision myself returning here again. My friend Tommy and I decided to give Texas Roadhouse a try on a recent weekday evening. We used the call-ahead seating and were immediately seated, though I will say they were not quite packed that night and had a few open seats. Nonetheless, I can imagine that on the weekends they really pack 'em in! We were promptly greeted and escorted to our seats. Abby, our server, asked if it was our first time. Since it was, she explained a bit about their menu, some of the options, and the emphasis they have on making things in-house. It was very helpful. She quickly took our drink order and then promptly too our order for a few appetizers. In the meantime a bread basket arrived. I could swear that Abby said they were made in-house, but perhpas she meant "baked in-house" because on our way out, we saw someone loading up baking pans with the frozen rolls. No matter, they were fresh and very good, served with a cinnamon butter. Absolutely delicious. I love trying various appetizers in a new place, and getting each restaurant's "spin" on some of the standards. 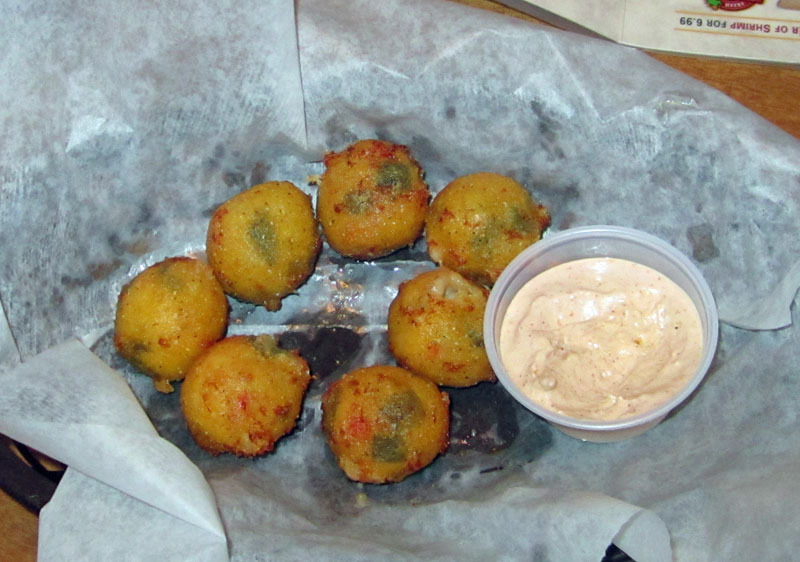 For our first appetizer we ordered the Rattlesnake Bites -- rounds of jalapeno peppers mixed with jack cheese, then battered and deep fried. They were surprisingly good. They were served with a cajun horseradish dipping sauce. Both the bites and the sauce were good, but I did see a few areas for improvement. Over time as the bites sat, a bit of grease pooled at the bottom, on the waxed paper--I'd suggest they use a napkin or the like to soak that up. Also, the cajun horseradish sauce was good, but cold and a bit "stiff" -- it would have been better if freshly portioned and more at room temperature, or at least stirred a bit. And, by the way, we were served 10 pieces, but were so entranced that we ate three before I could even take a picture! 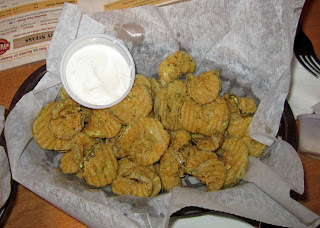 We also had the Fried Pickles, pickle slices that were deep fried and served with a ranch type sauce. These were good as well but suffered from to much salt. When you serve something as acidic as pickles, you need to cut back on the salt just a bit. They overdid it here. Also, it had the same grease-pooling issue as the Rattlesnake Bites, something that could be fixed by something absorbent like a napkin in the bottom of the dish. But still, they were pretty good overall. We both had salads for one of the sides for our main dish. The salad was light and refreshing. 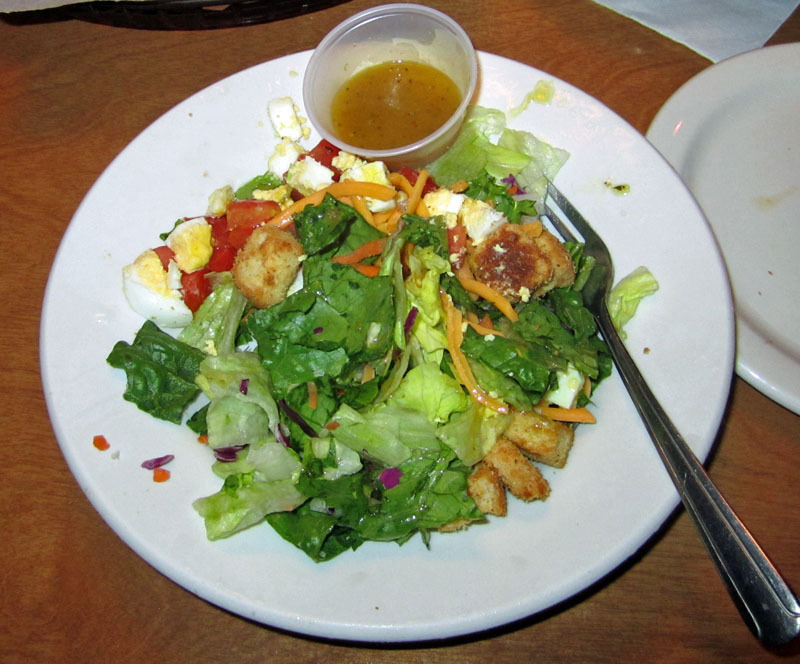 The waitress checked to make sure we were fine with eggs, tomatoes, and croutons on our salad. We were, but it was nice that she checked first. For my main course, I ordered the Texas Size Combo--I had the Pulled Pork with a side of ribs. All I can say is... Wow! The pulled pork and ribs both had a nics smoky flavor. The ribs were literally fall-off-the-bone delicious. There was no fat to be seen, and when I attempted to cut them, the bone just fell out, nice and clean. They were excellent and well cooked. 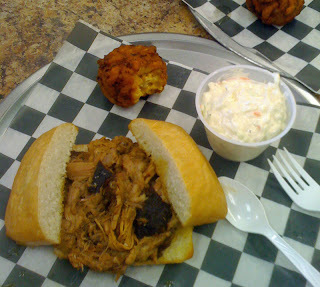 The pulled pork was equally great. 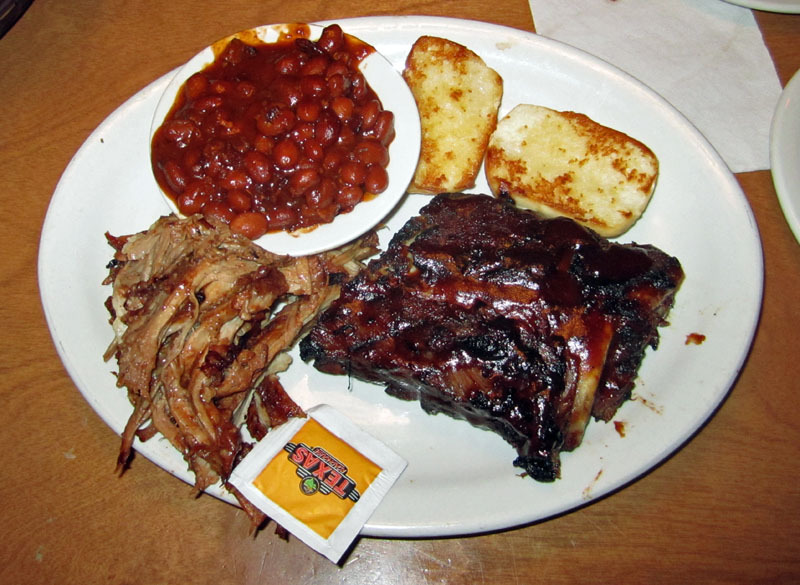 And I had a side of baked beans--they were excellent--nice and tender yet not mushy, with a hint of smoke and BBQ, just very good. I loved this combo! 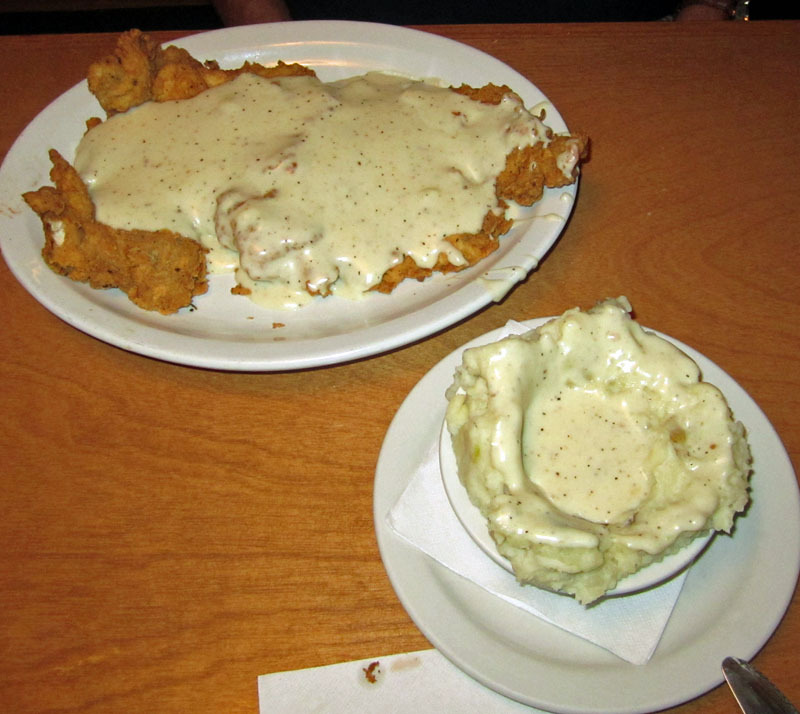 My friend Tommy had the Country Fried Chicken, a breast of chicken that was battered, hand fried, and served topped with country gravy. The chicken was very tender and the gravy was very good. For a side he had the mashed potatoes topped with the same gravy. They were also excellent. It was all very good. As we were at the end of our meal, the manager stopped by to enquire how things were. She also gave us a smal bag of peanuts and a coupon for next time, since it was our first visit. I thought that was a very nice touch. 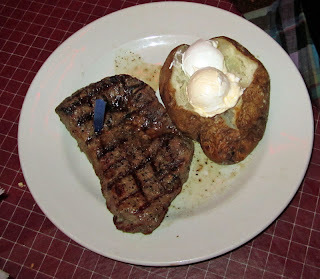 From good food to good service, I was impressed with Texas Roadhouse. I liked this place a lot, and I will be back, you can count on it!